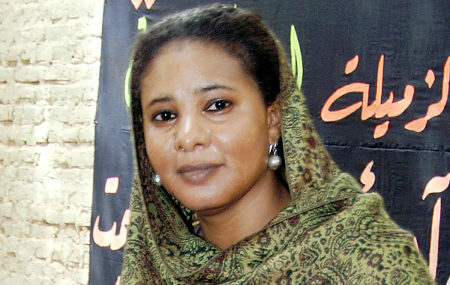 (FILES) Sudanese journalist Lubna Ahmed al-Hussein poses in Khartoum on June 13, 2009. Al-Hussein, who writes for the left-wing Al-Sahafa newspaper and works for the media department of the United Nations Mission in Sudan, was preparing to be flogged 40 times in Khartoum on June 29, 2009 for wearing “indecent” clothes, with 10 women already whipped for similar offences against Islamic law. The journalist was was arrested in Khartoum earlier this month after being caught wearing trousers.